As we progress into our fifties, the lens of our eye can start to harden due to the clumping together of the proteins in the interior lens. This clumping of proteins turns the lens a brownish color, while causing your vision to become blurry, similar to looking through a foggy window. If this sounds familiar, then you have a cataract. Cataracts are more common the older you get, making your normal day-to-day activities a real hassle or even impossible. They affect your entire vision. 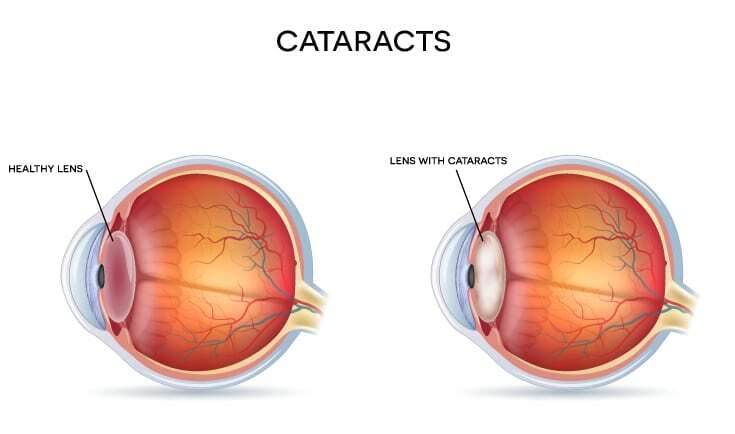 Cataracts can be caused by severe trauma to the eye and many other factors, as well as old age, and the only way to regain your vision is through surgery. We recommend getting cataract surgery before the cataract starts to make your vision nonexistent and your daily routine difficult. At Kerrville, we can remove your foggy lens and offer you a premium intraocular lens (IOLs), giving you the clear vision you deserve. Cataract surgery also frees you from having to wear glasses, because you will be able to depend on your own vision again. Nuclear cataracts are mostly associated with aging; they form deep in the central zone of the lens. Subcapsular cataracts develop at the back of the lens and are seen most in patients with diabetes, pronounced farsightedness, or retinitis pigmentosa, or those who take high doses of steroid medications. Cortical cataracts are known by their white, wedge-like opacities that develop from the outer edges of the lens and move inward toward the center. This is most commonly found among diabetics. Whether or not cataracts are preventable is a controversial topic, however there have been nutritional studies done that have shown that diets high in antioxidant rich fruits and vegetables may help prevent certain types of cataracts. While most cataract patients are over the age of 50, some people may develop them earlier due to diabetes or injury. Some patients can also be born with cataracts, which is known as congenital cataracts. If you think you may be suffering from cataracts, contact our Kerrville office today for a free consultation to get more information on your options or to schedule a cataract exam.